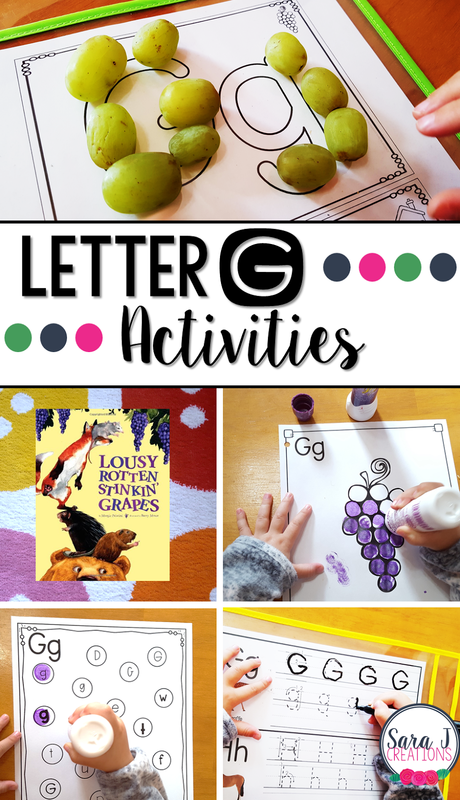 Preview: Letter G Activities that would be perfect for preschool or kindergarten. Sensory, art, fine motor, literacy and alphabet practice all rolled into Letter G fun. Up next in our weekly alphabet study is the letter G activities. We had some handwriting practice, fine motor practice, art project and some review of all of the letters we've learned so far. I like to go back and review to make sure she is remembering the letters we've done the previous weeks. To start our study of the letter G and a week of fun activities, we read the book Lousy Rotten Stinkin' Grapes by Margie Palatini . We talked about how the word grapes starts with G. Then I showed my daughter what a G looked like in the book and we searched for other G's. I made sure to pick a book that matched the picture that we would create next for our alphabet art book. We also found a YouTube video of the book. For the alphabet book we are working on, we added G is for Grapes. We decided to color the grapes with our purple dot markers. The alphabet book is part of my Alphabet Centers with Real Pictures. To practice writing the letter G, I put our alphabet tracing sheets in a reusable plastic sleeve and gave her a dry erase marker. She LOVES this part each week and asks to do it multiple times a week. She is actually doing a much better job than I expected of tracing the letters neatly, though she likes to write from right to left. We practiced identifying the letter G in all different fonts with our G page from our Alphabet Centers pack. I give her a dot marker and let her go. This is an easy activity that she can do while I'm setting up the next activity. For some fine motor practice, we used some green grapes that were on their way to the trash. The ABC sheets are part of our Alphabet Centers with Real Pictures. She picked each grape out of the bowl (practicing her pinch and grab skills) and lined them up on the letter G outlines. Since it was close to Halloween, we did an EASY "g is for ghost" snack. I just drew a ghost face with a marker onto the packaging of a cheese stick. Easy Peasy. We did a little review of the letters we've learned so far by using our two piece puzzles from our Alphabet Centers with Real Pictures. We used the upper case letters and matched them to the picture that started with that letter. My daughter mostly used the puzzle piece shapes as clues to help her but I tried to help her with the sound and connect it to the words we used in our ABC book. We also tried out a new game called Sequence Letters. I learned how to play the original Sequence when I first met my husband and last year we introduced the girls to the game by using Sequence for Kids that involves matching animals. Sequence Letters was perfect for my kindergartner since it is all about beginning sounds. It was a little tricky for my four year old but she got some of the words and the colors on the board helped narrow down the choices. They aren't great at the strategy behind it (you need to get 4 in a row) and how to block each other, but that will come later.